Thomas Piketty’s Capital: How the French professor changed economics conversation in 2014. Not everyone buys the French economist’s ideas about wealth. But they’re debating the issues on his terms now. 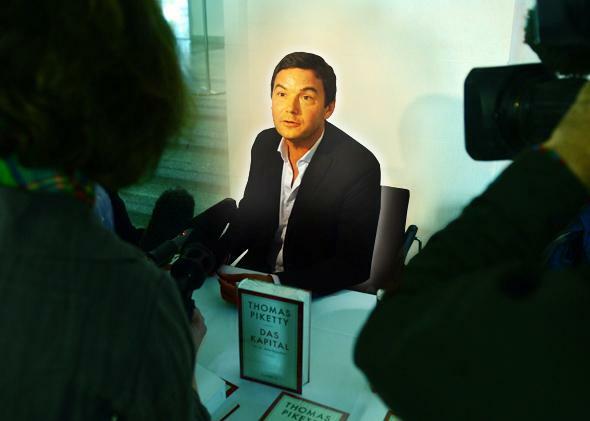 French economist Thomas Piketty speaks to journalists as he sits in front of copies of a German translation of his book Capital in the Twenty-First Century at the Economy Ministry in Berlin on Nov. 7, 2014. Photo illustration by Ellie Skrzat. Photo by John MacDougall/AFP/Getty Images. Nothing else dominated the economics conversation in 2014 quite like Capital in the Twenty-First Century, Thomas Piketty’s best-selling opus on the past, present, and future of wealth and inequality. So with the end of the year approaching, I emailed the professor to ask how he felt about the reaction to his book—which argues that unchecked capitalism will lead to a worsening wealth gap and the return of dynastic fortunes—now that some months have passed since the initial burst of enthusiasm that made it an unexpected hit. “In my view,” Piketty wrote back, “one of the most interesting and positive impacts of the book is that [it] induced a number of governments to open their fiscal files, particularly in Latin America and Asia. So right now I am very busy with the extension of our World Top Incomes Database to more and more emerging countries.” He elaborated a bit, but that was the gist. The commotion over Capital has created new opportunities for Piketty to study how much of the world’s money is flowing to its rich, and to put the information online for all to access. Brazil, Mexico, Taiwan, and South Korea have all handed him the keys to their tax records. And that makes the man excited. To be honest, the response was a little dryer than I hoped. (A jab at his critics surely would have spiced this story up.) But it also underscored something important: In a crucial sense, Piketty’s view of the world is winning. Other economists may have yet to fully embrace his theories about the natural dynamics of capitalism. But the debate about inequality is now firmly taking place on the Frenchman’s terms. From foreign governments to fellow academics, everybody wants answers to the questions Piketty is asking. Even before Capital became a phenomenon, Piketty was one of the people most responsible for the way we talk about inequality today. After all, he and his collaborators, including University of California–Berkeley economist Emmanuel Saez, had pioneered the tax-data analysis that shed light on the incomes of the top 1 percent and gave Occupy Wall Street its stickiest slogans. But Capital changed the discussion by focusing specifically on wealth (the assets families own) rather than income (the money families earn). Before the book hit shelves, wealth played a minor role in the inequality debate. A viral video about how Americans vastly underestimate wealth concentration briefly generated a frenzy of attention in 2013. Writers as diverse as Business Insider’s Henry Blodget and economist Paul Krugman pointed out that the share of U.S. income going to labor was declining, while the share going to investors and capital owners was rising. But otherwise, takes on wealth inequality tended to start from the premise that nobody was paying a great deal of attention to it. But we do now, thanks to Capital. Predictably, economists are split on the merits of Capital’s big idea—though the breakdown doesn’t fall neatly along liberal and conservative lines. Heavyweights like Krugman and Robert Solow, both Nobel Prize winners, have been supportive while others, including right-leaning figures like Cowen and left-of-center thinkers like former Harvard president, Treasury secretary, and Obama adviser Larry Summers, have been critical. When I asked Justin Wolfers, a plugged-in senior fellow at the Peterson Institute for International Economics, for an assessment, he told me that while Capital had unquestionably forced economists to grapple with inequality in new ways, Piketty’s theoretical framework hadn’t made much of an impact in the field. “I have not been at an academic conference where someone uttered the phrase ‘r is greater than g,’ ” he said. Yet in December, highly respected Stanford University professor Chad Jones released an entire working paper exploring how r>g relates to concepts in macroeconomics. The field may not be going wild for the theory, as Wolfers suggests, but at least some researchers are engaging it outside the world of econ blogs. And in the end, it doesn’t matter if the academy gives Capital a gold star. What matters is that even its detractors are now considering wealth in a way economists haven’t in years—as more than income that’s been stowed away in a bank or brokerage account, as something that may have the power to shape the economy itself. Take Matt Rognlie, a young MIT Ph.D. student who’s written one of the most forceful and widely cited critiques of Capital’s framework. (Among others, Summers has echoed his thinking.) He largely takes issue with how the book treats the rate of return on wealth, or how much the rich can expect to make each year from their various investments. Piketty argues that in countries with slowing growth and stable savings rates, the amount of wealth increases relative to the size of the economy. (That’s already happening in the U.S., Europe, and Japan.) However, since rate of return doesn’t fall much, the share of income consumed by capital owners increases. (More wealth + the same rate of return = the rich get richer.) To simplify a bit, Rognlie believes this is unrealistic. Instead, he argues that as wealth stacks up, there’s more money sloshing around in search of investment opportunities, which should drive down returns enough to prevent the grim scenario of exponentially rising inequality that Piketty envisions. Again, it’s just talk. But talk is where policy begins. And we’re all speaking Piketty’s language now.